Jeanerette, LA – September 26, 2017: Louisiana-based shipbuilder Metal Shark is once again building multiple high-speed aluminum catamarans for passenger vessel operator Hornblower. In early August, Metal Shark received orders from Hornblower for four 97’ x 28’, 350-passenger USCG Subchapter K vessels. An additional 85’, 150-passenger USCG Subchapter T vessel has also been ordered. 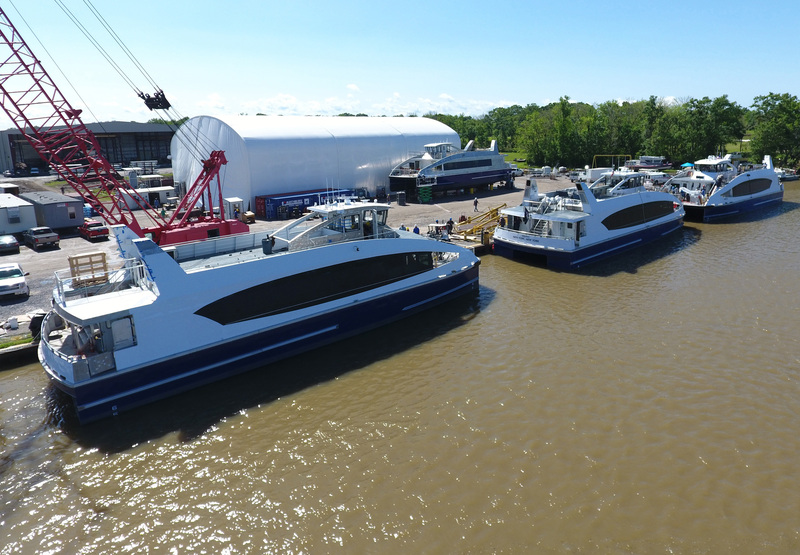 All of the new vessels are currently in production at Metal Shark’s Franklin, Louisiana waterfront shipyard, with accelerated delivery timelines calling for all five vessels to complete and deliver in 2018. It has been announced that three of the new vessels will be upgrades to the NYC Ferry fleet, which is operated by Hornblower. The new USCG Subchapter K vessels are designed by Incat Crowther and powered by twin twelve-cylinder, 1,400-horsepower Baudouin 12M26.3 diesel engines, coupled to ZF Marine ZF3050 gearboxes and turning custom five-blade Michigan Wheel propellers. These larger “Rockaway Class” vessels boast an operating speed of 24 knots. These new orders represent a continuation of Metal Shark’s relationship with Hornblower and NYC Ferry. In July of 2016, Metal Shark was selected to build six 85’, 150-passenger, Incat Crowther-designed aluminum catamaran ferries for the NYC Ferry System. Between April and June of this year, Metal Shark delivered all six vessels on time, with an average per-unit build time of ten months.